It is important to remember that this crisis and the subsequent recovery in financial markets was not the first time in history that periods of substantial volatility have occurred. Exhibit 1 helps illustrate this point. The exhibit shows the simulated performance of a balanced investment strategy following several crises, including the bankruptcy of Lehman Brothers in September of 2008, which took place in the middle of the financial crisis. Each event is labeled with the month and year that it occurred or peaked. See how $1 invested in the U.S. Total Stock Market grew over the last nine decades, as well as what was in the headlines in Time Magazine. Simulated strategy returns based on a model/back-tested simulation using 60% MSCI World Index (gross div., EUR) and 40% Citi World Government Bond Index 1-5 Years (hedged to EUR). Citi Indices used with permission, © 2017 by Citigroup. MSCI data © MSCI 2017, all rights reserved. Rebalanced monthly. This is not a strategy managed by Dimensional Fund Advisors Ltd., or any of its affiliates. 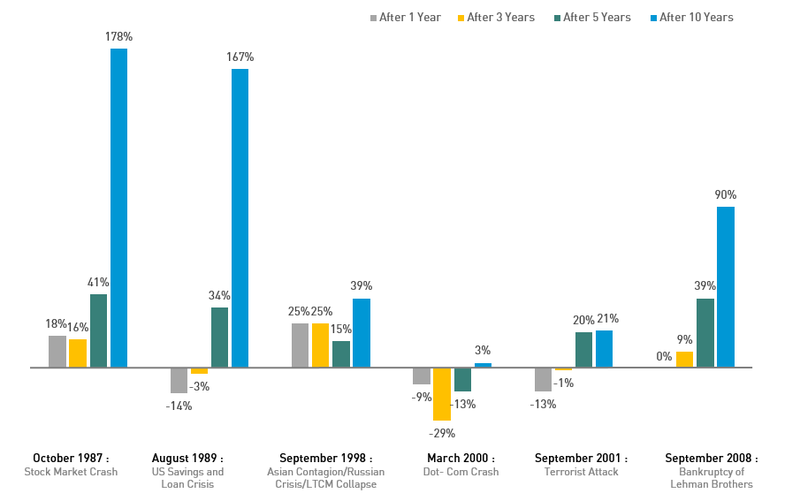 Although a globally diversified balanced investment strategy invested at the time of each event would have suffered losses immediately following most of these events, financial markets did recover, as can be seen by the three-, five- and ten-year cumulative returns shown in the exhibit. In advance of such periods of discomfort, having a long-term perspective, appropriate diversification, and an asset allocation that aligns with their risk tolerance and goals can help investors remain disciplined enough to ride out the storm. A financial adviser can play a critical role in helping to work through these issues and in counselling investors when things look their darkest.
. In the case of September 2008, the return relates to the available data of 9 years through 30/09/2017.